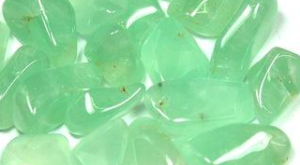 History/Mythology: Many shops in recent times are selling Prehnite as ‘New Jade’, so please be careful with the stones you are purchasing. Prehnite is a stone of unconditional love and it helps you to always be prepared. Seals the auric field to protect from outside influence. Can be used in the garden to bring peace and healing energy to this space, also helps to declutter your surroundings. Restores trust in the universe and manifestation. Relieves deep fears. Prehnite can help you to connect with higher beings and enhance and strengthen your connection. Healing – Good for diagnosis. Healing for kidneys, bladder, thymus and lungs. Can stabilize malignant tumors. Prehnite should be worn for a long periods of time in direct contact with the body so that it is within your auric field. This can be done easily for women by placing a piece in your bra or worn as a piece of jewelry. Can be used in all meditations group and single to bring through a deep peace and sense of love.